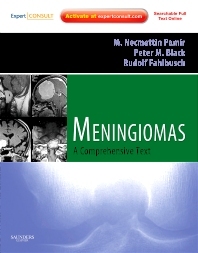 Meningiomas, by M. Necmettin Pamir, MD, Peter M. Black, MD, PhD, and Rudolf Fahlbusch, MD, presents current and comprehensive guidance on this most common, yet clinically challenging type of brain tumor. Written and edited by the world’s most prominent brain tumor neurosurgeons, it helps you to not only determine the type and location of the tumor, but also the most ideal surgical approach to provide your patients with the best outcomes. An extensive collection of surgical photographs covers unique and original cases, while discussions of pre-surgical techniques and approaches emphasize decision making with the help of all imaging modalities and analysis of symptoms and patient history. Expert Consult functionality enhances your reference power with convenient online access to the complete text and illustrations from the book, along with videos that depict surgical techniques in real time. Provides access to the complete text online—fully searchable, along with all of the illustrations downloadable for your personal presentations, and real-time surgical videos covering microscopic extended endonasal approach to suprasellar meningioma, and more, at expertconsult.com. Covers today’s full range of management methods, including adjuvant therapies, providing you with the best strategies for obtaining optimal outcomes. Features the work of the world’s most prominent brain tumor neurosurgeons—a completely international authorship—bringing you the best procedures globally. Offers an in-depth section on surgical methods and approaches based upon tumor location, to help you in the decision-making process. Includes coverage of spinal meningiomas including pre-diagnosis symptoms and outcomes. Founding Chair, Department of Neurosurgery, Franc D. Ingraham Professor of Neurosurgery, Harvard Medical School, Brigham and Women's Hospital Department of Neurosurgery, Boston, MA, USA.